Bitcoins have been in the news for most of 2013 and the first month of 2014. It's the most popular cyber currency, and it's said to offer a number of advantages over traditional currencies. Bitcoins have been increasing in value over the long run as more and more people have discovered them and started using them for transactions, and at this point, more than 60,000 transactions are being used with bitcoins each and every day. While some people associate the cyber currency with certain types of shady activities, it has a much better reputation for the Canadian ATM that opened for bitcoin transactions and people who have built mining computers to mine the currency electronically. With the popularity of this cyber currency exploding over the past year, it's no surprise that online casinos have started to take a look at using it for deposits. 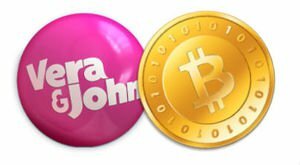 Vera&John Casino have recently become the very first licensed online casino to offer bitcoin as a deposit option. Players will be able to make deposits with much smaller fees than before because the verification structure for bitcoin is built into the currency itself. This removes third parties like banks from the transactions, and that reduces costs for both the players and the casino. This is great news for people who are fans of the currency. It was created a little more than five years ago by a person who went by the name Santoshi Nakamoto, and it was designed in such a way that people would mine it electronically. It's also designed to have a limited supply that ramps off over time, and this helps to prevent both over-inflation and value manipulation. The bitcoin became particularly popular in 2013 when a number of news outlets reported on it and people started using it more and more. Vera&John Casino has been around since 2011. They have made quite a name for themselves since they depart from a number of the conventions that have been set in the online casino industry. For example, they use games from a number of different software providers such as Net Entertainment, Betsoft, IGT, NextGen and others. This gives them one of the best selections of top titles that you can find anywhere. On top of that, they're always pushing the envelope on the other aspects of their business, and you can really see that in action with them being the first regulated casino to offer bitcoin transactions.